Karachi: March 25, 2016. (PCP) Dr. Nazir S Bhatti, President of Pakistan Christian Congress PCC in a statement issued here today from PCC Central Secretariat have said that Chairman Pakistan Peoples Party PPP Bilawal Bhutto Zardari speech in Umerkot Sindh during celebration of Holi to demand any minority individual to be President or Prime Minister of Pakistan like India is such a dream which can never be fulfilled and seems mockery of oppressed and persecuted religious minorities in Islamic Republic of Pakistan. According to Third Schedule, Oaths of Office under Article 42 of oath of President of Islamic Republic of Pakistan and under Article 91 of oath of Prime Minster of Pakistan, the constitution clearly reads as: (I, ____________, do swear solemnly that l am a Muslim and believe in the Unity and Oneness of Almighty Allah, the Books of Allah, the Holy Quran being the last of them, the Prophethood of Muhammad (peace be upon him) as the last of the Prophets and that there can be no Prophet after him, the Day of Judgment, and all the requirements and teachings of the Holy Quran and Sunnah) which restricts any minority individual to hold these posts. Will Bilawal Bhutto Zardari or Pakistan Peoples Party PPP dare to amend Article 42 and Article 91 of constitution of Islamic Republic of Pakistan which legislated by his grandfather ZA Bhutto in 1973 by PPP? 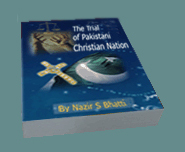 Questioned PCC Chief Dr. Nazir S Bhatti Dr. Nazir Bhatti said �Bilawal Bhutto Zardari must realize that in Sindh province which is under rule of his Pakistan Peoples Party at present have no representation of Christian in Sindh assembly when two Christians were part of it from 1985 who were winning elections under Separate Electorate but now all seats reserved for minorities have been allocated to Hindu minority on Selection system while Christians are second biggest minority in Sindh after Hindus and on number one in Pakistan� Nazir Bhatti reminded Bilawal Bhutto Zardari that his mother Shaheed Benazir Bhutto in meetings with Pakistan Christian Congress PCC assured that instead of Joint Electorate which enables Muslim parties to select minority individuals of their choice will allocate Dual Voting rights for minorities that they may elect their representation with their votes and also vote for Muslim candidates in elections in respective constituencies. Benazir Bhutto Shaheed publically demanded Dual voting rights for minorities in 1996. What Pakistan Peoples Party PPP gave minorities in 18th Amendment in 2010 in constitution of Islamic Republic of Pakistan? Nazir Bhatti said that negating Shaheed Benazir Bhutto promises, identity of minorities was scratched by devolution of ministry of minorities affair, declaring them n0n-Muslims and snatching right of vote to elect their representation but Article 42 and 91 were not touched when PPP can legislate it; Dr. Nazir Bhatti said that PPP, PML (N), MQM, PML (Q), PTI, ANP, JI, JUI or any other political party led by Muslims is not serious to bring religious minorities of Islamic Republic of Pakistan in mainstream politics of state and ready to give them due share in resources of state but when PML (N) grabs power the homes of Christians are set on fire and when PPP in power it denies due equal democratic rights for minorities as we witnessed in legislation of 18th Amendment. PCC Chief said that there are 96 constituencies of National Assembly of Pakistan where Christian vote is balancing vote and any candidate can be returned candidates with their vote but Pakistani Christian not trust on promises of any Muslim political party anymore because none is serious to consider their basic issues. Dr. Nazir Bhatti urged PPP Chairman Bilawal Bhutto Zardari that instead of promises of making minorities to President or Prime Minister of Pakistan he will try to fulfil promise of his mother Shaheed Benazir Bhutto to give voting rights to minorities to elect their leaders under Dual Voting rights that minorities may have true representation.